Sutherland’s flag was revealed on December 14th 2018. It was the winner in a vote of four finalists, held in November 2018 which had been selected by a judging panel rather than a public vote. The plangent criticism of this original selection process led to the imposition of the public vote. The newly registered flag was unveiled at a ceremony hoisted by the county’s Lord Lieutenant. at Highland Council’s offices in Drummuie, Golspie and attended by representatives of HMS Sutherland, local veterans and pipers from Sutherland Schools Pipe Band. which depicted a black raven or eagle against a white field. The vote had been arranged following local dismay over the originally chosen red and gold bi-colour, bearing a counter-changed front facing eagle and three gold stars. alongside the white and blue version adopted by another branch of the family in Moray More information on the arms is available here. The competition took place across September and October 2017, with judging taking place on Monday October 30th at Drummuie. Three hundred and twenty-eight entries were received, from as far afield as New Zealand, Japan and Sweden with many featuring the county’s wildlife. A Selection Panel, chose several of the designs for presentation to a Judging Panel, comprising the Lord Lyon, Philip Tibbetts of the Flag Institute and members of local schools, council and the Lord Lieutenancy’s team, the Sutherland Flag Steering Group, who decided the winning entry from amongst the designs selected. , said there had been a “phenomenal” 328 entries, reflecting the wide interest shown in the project throughout Sutherland and particularly from the county’s schools. and the foamy seas of the coastline. The first two of these three designs, featuring the three stars and bicoloured cat design, featured in the subsequent, November 2018 vote along with the originally selected, amalgamated design. , allowed for plenty of choice to select perhaps six varying designs, which could have then been put to a public vote. Given sufficient choice and the opportunity for the Sutherland public to have had a say in the matter, there would have been less cause for complaint about the final selection from aggrieved residents. That said, the process had been described and publicised for nearly a year without any comment or criticism from any party. “ “The Land of the Cat” is properly Caithness, not Sutherland. The original land of the Cat or ‘Cait’ (from about 800 AD) centred on Caithness and just included a small part of south-east Sutherland. The confusion comes from the Gaelic name for Sutherland, which is ‘Cataibh’, which does indeed mean ‘cat land’, but it originated when south-east Sutherland and Caithness all fell under the one Pictish region. Unity of the county, especially including the west and north, was considered the key factor by the selection committee, so selecting an emblem that was historically limited to only a very small part of Sutherland (the south-east) and another adjacent county, might reasonably be considered to have been unrepresentative of the county as a whole. Arguably a plain gold eagle against a red field might have been sufficient and made the design less “busy” but use of a bicoloured field and counterchanged eagle illustration ( red part on yellow and yellow part on red) reflects both species of raptor present in the county, the red being a sea eagle, the yellow, a golden eagle as detailed above. Combining the two also emphasised the sought for “unifying” factor. , describes the bird included in the design as “a raven or spread eagle of the Norse Jarldom”; the creature shown certainly more closely resembles an eagle than a raven. one branch of which was established in the Dornoch area. It might be further considered that eagles are rare creatures in the British Isles, being the home of such magnificent birds is surely something of which to be proud, worthy of celebrating on a flag? However, it is true that the “orientation” appears not to make sense as the red portion representing the west, is on the right of the flag as observed and the gold part is at the left hand side of the flag, this colour scheme does not reflect the geographical distribution. The choice of red and yellow per se, was also subject to heavy criticism. This, however, seemingly exhibited ignorance of the heraldic history of the locality, as detailed above. Although a newly contrived flag is not obliged to follow the colour scheme of previous charges in the area, it is as legitimate a basis as any other option and having been around since about 1150 (! ), these are regarded as the county’s historic colours. There was a great call for shades that reflect the county’s landscape, a specious argument however, as by this reckoning all flags would be green and blue to represent land and sea with perhaps some yellow for the beach! Flags do not uniformly feature colours that symbolise geography, some do but it’s not an obligatory practice. Certainly, Sutherland’s terrain does include heather, so an uncommon, purple, could have been an acceptable choice to include but not using purple or green, by itself, is not a valid reason to condemn the final design; whilst these were options, they were not mandatory. Dunrobin Castle, the latter signalling to HMS Sutherland in fact! The Duke, of Sutherland, Leveson-Gower, bore his own, entirely different, starless coat of arms. 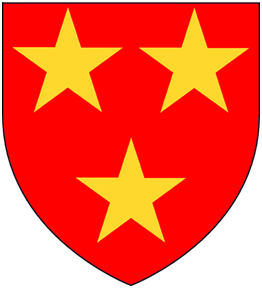 Significantly, as asserted by Colin Gilmour “..the three yellow stars on a red background were on the shields carried by the “Sutherland contingent” in fights against the English at Bannockburn in 1314 (3rd Earl of Sutherland); Halidon Hill in 1333 (4th Earl of Sutherland); and probably at Neville Cross in 1346.” He further confirmed that the traditional red and yellow featured in a very large number of competition entries. Again, the stars did not have, to be included in the final design but their inclusion has a valid and firm basis. Comments about the red and yellow, the eagle and the stars, being “Communist” reflect people’s greater familiarity with the icons of far flung regimes, than with their own locality. Because a design bears a superficial resemblance to something else is not a valid reason to condemn it, especially when that condemnation is made without regard to the actual relevant derivation of the elements being used. so the emblems and combination are not without local precedent. As can be seen above, the red and yellow colours and stars, which seem to have come as a bit of a shock to many modern residents, appeared on several competition entries although clearly, local sentiment has favoured a flag that recalls the natural landscape, rather than the long established “county colours” of red and yellow/gold. In the above sample, one design cleverly takes the colours of the Sutherland Clan tartan and deploys them as a Nordic cross; the same designer has also created several cross flags that feature a representation of a kelpie, a horse like creature of local legend. His other designs combine Sutherland stars with a cross in differing colours. The eagle and stars are set against a red Nordic cross on yellow in the first design and the centre one combines a saltire, with the red and yellow colours and stars and the much favoured wildcat. This entry was posted in Sutherland. Bookmark the permalink.